For visual artists and fine art photographers who want to break into the fine art giclee print market, the 2nd Edition of How to Profit from the Art Print Market will be an invaluable resource. Long time readers know I am a strong advocate of using publicity and press releases as a key component of any art marketing strategy. As I also believe in walking my talk, I have a press release out today with the above title. 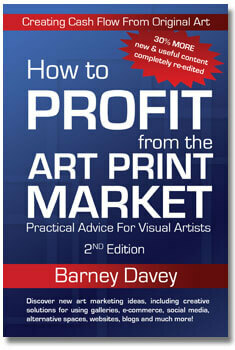 Its goal is to promote the recent release of 2nd edition of How to Profit from the Art Print Market. Coordinating marketing efforts to create synergy is also part of what I preach. Besides scheduling a press release my book, I took part in the smARTist Telesummit MasterMind Panel this week. Click the link for a free excerpt of the Day 1 Panel. You also will find me on a Web Broadcast this Tuesday, January 18 with Jason Horejs of Xanadu Gallery. The subject is: Creating New Marketing Opportunities with Giclees | a Conversation with Barney Davey. Jason is the author of the top selling book, “Starving” to Successful: The Fine Artist’s Guide for Getting into Galleries. His insightful straightforward advice offers great advice for artists seeking to work with galleries. The press release submitted via PRWeb.com is below. As an FYI, the release for the first edition has been accessed 63,000 times. For visual artists and fine art photographers who want to break into the fine art giclee print market, the 2nd Edition of How to Profit from the Art Print Market will be an invaluable resource. On January 14, 2011, the book became available through online bookstores and the publisher at www.barneydavey.com. Scottsdale, AZ (PRWEB) January 17, 2011 — The expanded and completely revised second edition of How to Profit from the Art Print Market details how artists can use giclees to make more money, diversify portfolios, increase price points and find new buyers. Its authoritative advice arms readers with practical directions they can use to capitalize on opportunities in the changing fine art giclee print market. Artists will discover how the evolution of digital fine art print-on-demand technology (aka giclees ), e-commerce, social media, and changing consumer habits are disruptive forces they can harness to create exciting new ways to sell their work. The book’s clear guidance on the decision to self-publish or to work with a publisher will be welcomed by visual artists. They will learn that top selling artists have enjoyed successful print market careers with either choice. The book sheds light on how disruptive forces have marginalized to near extinction traditionally reliable sources of new business, such as trade advertising and tradeshows. It also provides insights on how artists are finding they can sell direct to collectors without abandoning traditional marketing partners such as galleries. Other topics include selling art online, social media marketing, art licensing, the economics and marketing of self-publishing, common traits of exemplary self-published artists, finding and working with publishers and with giclee printers, identifying trends and more. Readers will find the expanded Resources section a prized useful tool. A review of the Table of Contents reveals timely updates and four new chapters. Ironically, despite demonstrable upside potential, solid advice for artists on how to benefit from the print market is nonexistent among the abundance of art marketing books. The second edition of the book continues to fill the void in providing insightful, informative art print marketing education for visual artists. It demystifies an art print market that many find baffling. The first edition of How to Profit from the Art Print Market has been a bestseller on Amazon.com’s “Business of Art” category since its publication in 2005. It was excerpted in The Artist’s Magazine and was a selection in the North Light Book Club. Arts organizations, artists guilds, groups, associations, societies and clubs are encouraged to use the book for educational and fund raising activities. They should visit the publisher’s information page for details. Art educators are welcome to contact the publisher to learn about special educational prices. Barney Davey, the author, is an art industry veteran who began his career in 1988. He publishes and produces books, blogs, media, workshops and seminars for visual artists. He also publishes the highly respected Art Print Issues blog. Its top page view ranking proves it to be one of the industry’s most popular business blogs. Davey’s newest project, www.GicleeBusiness.com, is a comprehensive giclee printer directory and art business products and services resource.